Mega Tickets are history turned into unique wall art. They are created from actual tickets, enlarged 300-500%, printed on archival canvas and hand wrapped on wooden stretcher bars. - We have over 1,200 Mega Tickets currently available. - Personalization available as well. 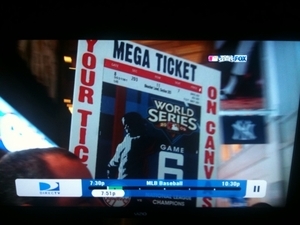 * The photo to the left is of our Personalized Mega Ticket being shown on the Fox TV broadcast of Game 6 of the 2009 World Series, minutes before the first pitch. TMT was set up at the game in the Great Hall taking orders.